My work attempts to reconcile the tension between instability and balance, breakdown and recovery, with the use of architectural structures within organic conditions. I wish to engage the sublime, as a response to events that surpass our understanding and imagination due to the unbounded, excessive, or chaotic. Connected to the sublime is the notion of ruination. I am interested in how fragments of the past as well as the present, can be used to reimagine the future. My daily experience of living within the World Port of Los Angeles and witnessing of the continual growth and rebuilding of this industrial expanse inform this work. Also, imagery such as radar dishes, abandoned spy stations, and relics of the WW11 machinery are cobbled together to create great striving machine- like forms that peer both backward and forward in space and time. Here, fragments of the past are assembled into symbolic structures that reference ongoing collapse while heralding an uncertain future. The landscape arena functions as a metaphor in the work, and represents our exterior “state” both literally and figuratively. I believe landscape can best mirror our culture’s complex relationship with nature, as well as contain and unfold the expanse of one’s imagination. I use vast fields of emotive color, and the implication of the horizon to reference the historic sublime, however, my aim is to expand upon that notion by emphasizing a submersion in and yielding to a highly destabilized painted space. Painting has the ability to embody the notion of time, and to suspend the present moment within a physical form. With great nuance, painting has a way of prolonging a visual read by providing a symbolic structure wherein the viewer can negotiate the past and the future by accessing the present moment. I paint to find a form capable of reflecting the paradox and complexity of the world. A structure is a form of organization. It carries meaning that radiates through social, political and personal space. It is a system that holds things together until the forces of entropy destabilize the structure and, in its collapse, it becomes something new. This ‘becoming something new’ is the metaphoric fabric holding Marie Thibeault’s paintings in balance. It is a need to represent the ‘place’ in the world that she inhabits and transform it into richly layered paintings, where the plastic forces of space are in tension. Linear delineations of buildings, shipping containers, radar dishes, and cities are wedded to a painterly process that takes this raw information and re-purposes it into beautifully realized works of poetic force and imagination. It is the metaphoric reinterpretation of entropy wielding it’s irreversible force on a system and, in its collapse, that something new is born. Her paintings address contemporary issues about our impact on the environment, of our unsustainable systems in whose wake “anarchy is loosed upon the world”, and of the aftermath of calamities, both natural and human. But these are not dystopian paintings. They are the metaphoric transformation of these destabilizing forces into a new order. In her work, Thibeault uses her imagination and the intrinsic power of painting to shape and affect the way in which we see and interpret the world. These paintings are in part about the infinite capacity of our selves and the world, to shed its skin and transform itself; to rise like a phoenix from the ashes and to create a new order. We are carriers of information: the sense impressions accumulated over a lifetime as well as the memories that are genetic and the inheritance from our families and our ethnic origins. Memory is a complex pattern of interlocking structures. Fear, trauma, love, hope, and desire, these emotions and sense impressions co-mingle with the ineffable forces of biology and spirit – to become our ‘self’. This strange emergence of consciousness through which we filter the perceivable world; it is the quicksilver, shape-shifting, malleability of consciousness that is at the heart of ‘optimism’; the ability to continually rebuild and renew grows out of this metamorphic potential. Thibeault is an ambitious painter. Her work wrestles with the realities on the ground but seeks to transform them into poetic vehicles that speak to the ever-becoming principle of existence, of change and renewal. She lives in San Pedro and teaches at Cal State University Long Beach. Her everyday routine is to drive over Terminal Island, crossing the Vincent Thomas and Gerald Desmond Bridges, looking down upon the vast ‘city’ of shipping containers in the port of Long Beach. Container ships, cranes, trucks and other vehicles are a constant part of her ‘place’ in the world. The wondrous machines that make the global economy and trade possible, but are also enablers of unrestrained consumer addictions, strewing our environment and world with unnecessary waste. Her paintings are lyrical; they take the skeleton of systems and use them as an armature upon which to build poetic leaps of faith into their next incarnation. The rich history of both painting and of cultural and social systems these works represent, house the memory of that which was, and the imagination to create what will be. She spoke of the ‘feminine sublime’: “Historically the sublime in landscape has been from a male perspective – in which they come upon the powerful vastness of nature that affects us- and represent it from a distance. They are outside looking in. In the female sublime we immerse the body within nature, seeking to find a way to position the body within the space, to become a part of it.” In Thibeault’s paintings one becomes immersed in the lush color chords and the layers of information that reference the complexity of our world; the collapsing of old orders and the emergence of something new. In earlier works she did a series of paintings based on photographic images of New Orleans and other areas destroyed by Hurricane Katrina; the mangled cars, homes and buildings became a jumble of information that reference these man-made structures and objects and speak to the destructive forces of nature. She used the metaphoric power of painting, the dexterity of its plastic potential, to transform this information. It is in part the modernist history of art in which artists sought to deconstruct painting in order to find new organizing principles and new truths that informs her ethos. In Cezanne’s work, his search for an inner order to the ‘chaos’ of nature led to a form of deconstructing and rebuilding painting from the inside out. Taking the hidden structures of composition and design and giving them a presence and force that radically transformed the art of painting, leading to cubism and pure abstraction. In Thibeault’s paintings she yields these insights and uses them to reconstruct a sublime order out of the chaos of the world. Collapsing systems become the ingredients to new painterly universes that seek a balance and emotional resonance, that create a ‘space’ for the body and soul to occupy. 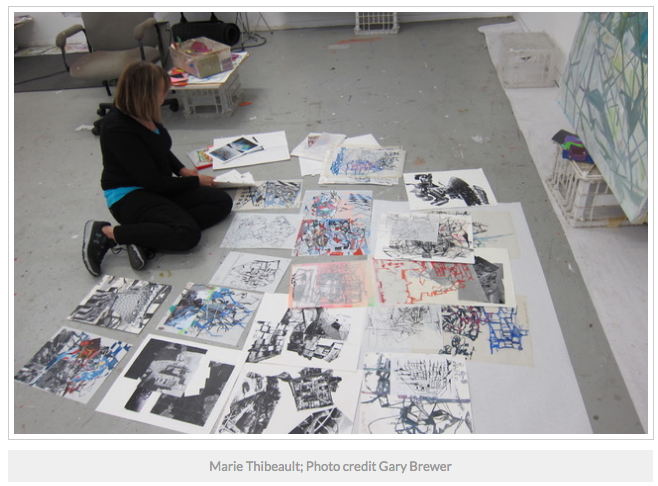 Thibeault is an intuitive painter; she makes countless drawings, engaging in a form of automatism blended with her source material, to discover new compositional possibilities. The drawings are conduits to her soul, allowing new narratives to emerge from an immersion into the oceanic swoon of feeling and emotion she wants to unleash in her work. She showed me some new paintings that were incomplete. “These works have a portal, a doorway to another ‘space’; I am not sure where or what this space is, but I am exploring this new idea. I am interested in creating a space for the body to occupy. It emerged organically from my drawing and is something that I will pursue to see where it leads.” It is the openness to inner needs that shapes the works. The raw information of the world and its discontents subjected to emotional and psychological forces takes her through the labyrinth – the golden thread that guides her is the rich history of painting. Art is the collective memory of the human race; it is also the memory of systems and life forms that preceded our species, whose memory imprint is etched in the tissue of our minds, bodies and spirits. Marie Thibeault creates paintings that seek to express the endless unfolding process of systems and the collective memory of the past that informs and shapes the future. Her works are alchemical experiments that take the wreckage of collapsed systems, and using the tools of painting, produce dynamic expressions of the sublime, to create an immersive space where one can inhabit the continual process of unfolding. Where Mallinson sees our relationship to possessions, Estes focuses her attention on the environment. She passionately confronts the havoc of climate change and her paintings chronicle the destruction of our natural world. In The Great Defrostshe depicts icebergs set against an acid orange sky melting into pools of blue waters. The colors are abrasive and her anger palpable in the angular and energetic marks. Burchfield’s Plea references the ecstatic reverence that Charles Burchfield brought to his landscapes, but in Estes’ version, the forest is caught in an inferno, doomed. Both paintings suggest our culpability and responsibility towards eco-systems under duress, a significant departure from the ways in which landscapes were historically depicted. It is said that in human history, our ability to see color has evolved alongside our ability to categorize and discuss it. Scientists have studied that throughout our documentation of what we have observed in history—especially as it relates to colors and descriptions of nature—has left out specific colors. Documents like Homer’s Odyssey, the ancient Icelandic sagas, Hindu Vedic hymns, the Koran, the ancient Hebrew Bible, ancient Chinese stories and the like make reference to colors in the way they describe the natural world, but they do not make any mention of the color blue. This evidence has convinced scientists that these cultures did not have a word for blue at the time, and therefore they may not have seen it an individual color. The ancient Egyptians are one of the only early civilizations that had a word for the color blue. Without a word for a color, without a way of identifying it as different, we do not notice what’s unique about it or that it’s unique at all. Hence, without finding a way to relate one color to another, through visual or written language, many colors may never appear to us. It is within the visual conversation and comparison that we find distinctive existence. The discourse we create about color enlivens the colors themselves through our experience of and with them. The visual exchange between colors and our perception of those colors—on their own or together with others—is the base for color theory and remains at the heart of art observation and appreciation. The power of color is well known in human culture—we utilize colors to speak truths without involving any written or spoken language. Every human-made object has to deal with this unyielding power, working with or against it to communicate effectively. Every artist has to make monumental decisions with regard to color and the power held within. 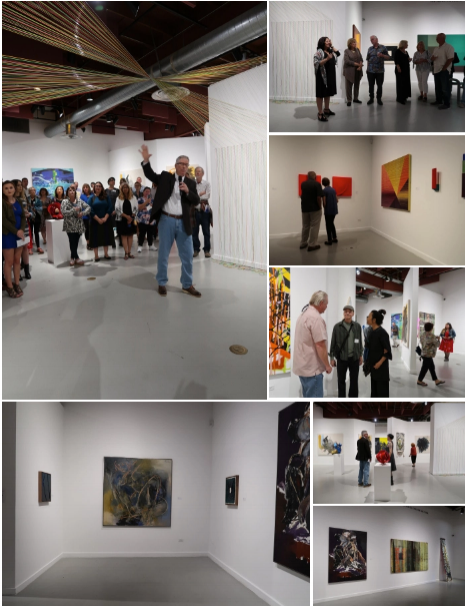 Curators Suzanne Walsh and Jim Ellsberry have used their love and appreciation for this power and perception to pull together 21 different contemporary artists who are dealing with color and power in fascinating ways. Each object in their collective gathering of color at the Huntington Beach Art Center (HBAC), in “COLOR VISION,” approaches the pigments, the energies, the applications, the emotive qualities, and the symbolism inherent in color to open up a larger conversation about out human experience in the physical world. Walking through the calm yet electric gathering of art and color in this large white space by the ocean, each visitor is immediately drawn to something specific, like a magnet pulling them toward a work of art. Whether it’s the red pigment of Caesar Alzate Jr.’s painting popping off the wall to meet you with motion and weight, or Connie DK Lane’s rainbow-referencing string archway asking to cover you in color as you walk, or the bright neon tubes of Adela Andea’s wall sculptures calling you toward them like a moth is drawn to a flame—the works in “COLOR VISION” are hypnotic and relentless. Standing front and center as you enter HBAC, like a lamassu at a citadel gate, Bret Price’s blue swirling sculpture greets visitors with an energetic introduction. Price bends color into whimsy with his metal sculptures. He curls and folds steel beams and pipes as if they were ribbons or straws, creating new non-utilitarian lives for structural metal, merging color and material to create something unique. This fascinating and intense process manipulates the metal material as it plays human perception, placing a sense of malleability on normally uncompromising objects. Price offers multiple objects to “COLOR VISION,” each with a completely different experience and seduction. Andrea Welton’s abstract stained paintings are striking visual representations of human souls, peeking out from a material reality. Standing in front of one of Welton’s paintings feels as though you are standing inside of yourself, feeling human emotion through color and movement—slow and sensual, each emotion forms its own perfectly imperfect shape, choosing to either interact with or ignore a neighboring emotion. The carnal minimalism in her layered paintings blend a variety of physical materials and techniques into a kind of ephemeral organism, embodying the dichotomy of living and dying, of feeling and thinking, or of creating and destroying—it is constant movement made stagnant. Victoria MacMillan’s large-scale urban landscape paintings are immersive and surreal. Greeting them in the furthest gallery in the space, along with a variety of more experimental expressions of color in art, transports you to another time and place—so similar to reality but empty of other humans and full of colorful growth. Like a mold or moss growing by a still body of water, bright colors creep into MacMillan’s scenes slowly, first at the edges and then gradually consuming every surface in colorful ecstasy. You feel as if an acid trip has gone exactly as desired, swallowing you whole and bleeding the edges of the periphery into pure blissful color, allowing you to endure this world for just a bit longer, giving in to the beauty only you can see. With 15 other amazing and colorful artists represented at HBAC’s “COLOR VISION,” it becomes clear with every new encounter that color theory is real and essential, and that your soul is replenished and rejuvenated by simply observing and considering these artistic interpretations of color and life. 538 Main Street, Huntington Beach, until June 16, 2018. At Gallery Elena Shchukina in London, the American abstract painters Kimber Berry and Marie Thibeault combine powers for “Neon Babylon,” their first UK show. Their mixed-media work—including an ironic reliance on plastic—showcases a conversation between the artists as they explore the sometimes troubled connection between society and the natural world. Berry’s large-scale works, taken from her “Plastic Garden” series, occupy the gallery’s first floor, while Thibeault’s canvases are situated on the lower level. 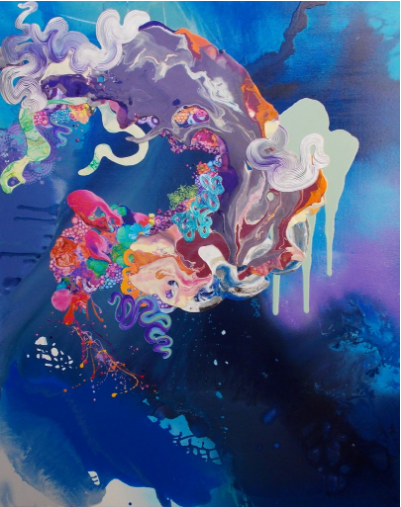 Combining plastics with paint and digital effects, Berry’s dynamic, fluid images radiate a distinct relation to the magical as they draw the viewer in with vibrant colors and chaotic compositions. Television Dreams of Tomorrow (2015–16) sees greens, reds, and purples drifting upward, as if their rhythm continues beyond the canvas into another dimension. The psychedelic patterns and flowing colors chaotically loop and interlink at different intersections, forming surreal landscapes that chart the human psyche as it twists through the natural world. While Berry brings to life the unconscious and myriad organic forms, Thibeault draws upon the relationship between man-made structures and the impact they have on the environment. She aims to break down her compositions, to create a balance that pursues elements of the sublime. Reflecting the chaos forced upon nature by man-made structures, her images are full of confusion and excess. 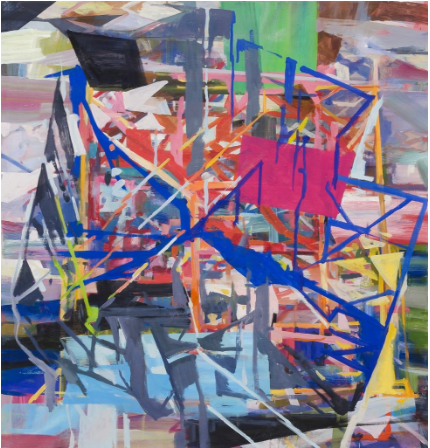 As in Berry’s work, Fortune (2016) explodes in colorful bursts, though Thibeault’s aggressive geometric lines create a more muddled milieu. The works of both artists impose upon the viewer a highly intense sensory experience. Though there is a degree of tension between the artists’ varied styles, harmony exists in their admirable mission to understand and convey the tenuous threads tying together nature and mankind. “Kimber Berry & Marie Thibeault: Neon Babylon” is on view at Elena Shchukina Gallery, London, Apr. 21–May 26, 2016. Follow Elena Shchukina Gallery on Artsy. This spring, Gallery Elena Shchukina will present a showcase of abstract painting by American women artists. HYPERLINK "http://galleryelenashchukina.com/exhibitions/25/"Neon Babylon, which opens 21 April, will mark the first UK exhibition for painters HYPERLINK "http://galleryelenashchukina.com/artists/77-kimber-berry/"Kimber Berry and HYPERLINK "http://galleryelenashchukina.com/artists/78-marie-thibeault/"Marie Thibeault. On show will be works from Kimber Berry’s Plastic Garden series, which considers the human psyche and our impact upon the natural world. The works are intricately detailed, with dynamic and organic shapes spiraling across the canvas. Each painting is mixed media, combining the artist’s use of plastics (an ironic and intentional nod to the subject matter) with paint and digital effects. The result is akin to a heightened and surreal encounter with the natural world, as though we are not only looking at a ﬂower but climbing inside it. Berry’s interest lies in our contemporary expansion into nature, and the blurring of reality and illusion. Berry conjures a sense of the imaginary – of landscapes teeming with both chaos and magic. Marie Thibeault’s work also considers the relationship between society and nature, exploring man-made structures and destruction, and combining ideas of breakdown and balance with elements of the sublime. Thibeault uses these elements, and the tensions between them, to make sense of events and changes that are 'unbounded, excessive, or chaotic'. At a time when man’s impact upon the natural world is an issue of such global importance, these works possess a certain urgency, reﬂected in Thibeault’s use of sharp geometry and bold colour, with subjects seeming almost to explode in fragments towards the viewer. This exhibition is underpinned by a dynamic consideration of a vital relationship – that of our society and the world we inhabit. But it also reﬂects upon the relationship between art and the future, forcing us to re-envision the natural world as it rapidly changes all around us. Since you use such a broad palette in each painting, and broadly balanced, a kind of chromatic contrapposto, I wonder if you could say a few words about what governs your decisions with color. Wow that’s a mouth full..I guess I take for granted how I heavily rely on color as a key element in the paintings. Lets back up a minute, where did this all start? I have always had an extreme sensitivity to color and this was encouraged by both parents and childhood immersion in the New England landscape where the rangeand nuance of color in the natural world, exceeds comprehension. My father was a color separation expert at a printing company ( before computers) and I remember playingwith red filters and sheets of rejected offset color lithography. I began painting in 8th grade, went to the Norwich Free Academy which contained a large art high school and the Slater Museum. Here I majored in art , learned to draw and paint and spent most of my free time painting landscape in thedeep woods of Connecticut. From there, a scholarship allowed me toattendto the Rhode Island School of Design , where everyone was under the spell of Josef Albers and Hans Hofmann. My painting teacher was the student of Hans Hofmann and my initial painting immersion there was focused on color as form and space and the theory of push and pull. Moving on from there to San Francisco , I found myself earning my MA in painting at SF State State University , and immediately became friends with a fellow graduate student. Mark Johnson. Mark was also from Connecticut and studied with Josef Albers Yale, and became his assistant. I learned an enormous amount of color theory from Mark, warm cool zoning, simultaneous contrast and the relativity of color, and to this day, enjoy hearing his stories of Albers. At UC Berkeley, we both continued to earn our MFA and studied with Joan Brown and Elmer Bischoff, both spectacular colorists. From Elmer I learned about saturation and color light, color mood and the connection to expression. For 30 years I have taught color at the University level. After several years, I developed my Advanced Studies in Color class at CSULB . Thisimmersion in color study and hands on teaching has been an ongoing magical and rewarding adventure in discovery of the psycho-physiological phenomenon of color and its function in painting. It is a joy and a privilege to expore and question color with my talented students. How much is predetermined, like deciding to start with a given green, and how much is discovered, like putting down green and finding it calls for pink, and so on. When a start a series I under paint in a color opposite from the painting I just finished so I can keep it fresh and not rely on a predictable pallet. Lately the paintings fling themselves toward blue or red, the most potent of the primaries. Usually , I tone and under paint the canvas with three or four transparent colors to achieve an unfamiliar neutral. The paintings have many layers and I challenge myself to find unusual responses to the previous layer. Do you adhere to a theory of color, or a given methodology? No , in fact, knowing too much about color harmony, I strive for color discord and expression. or did you just discover through trial and error that you were best served by covering a wide spectrum? Funny I don’t think of my paintings as having a wide spectrum but they do. I arrive at it in the process of layering and discovery , starting with monochrome ( which in my world is probably tons of cools or warms etc, currently Im working on black) ..then it widens as I find the space , meaning and focus. I am searching for resolution and balanceof image and abstraction. Coloris used as structural element to build form and space, as notation to indicateimage, or representation, and sign or symbol with specific reference to the subject and culture. Posted on 28 October 2015. With torqued, tilted, stacked and gridded elements, Marie Thibeault invests charged abstract paintings with a sense of entangled time. She does it with crisply defined wedges painted in saturated colors, large geometric and free-form shapes, and teetering hand-built webs that make for dense layers of space. These constructions reference urban development, airport terminals, maps, architectural scaffolding and system collapse. In the past, Thibeault has worked from photos of disasters — Hurricane Sandy in New Jersey andbefore that, Katrina in New Orleans, the subject of a 2009 show in this space. Now, her sources are more universal: e-waste, global warming, migrating ocean waste, shipyard environments and other places where worlds collide. The seven paintings on view in her current show, engineering, selected paintings, take us to the brink via upended tectonic plates through which we can see the tenuous remains of houses and buildings, contingent forms that barely keep chaos at bay. Thibeault orchestrates these works with a finely calibrated color sensibility, primarily sequences of blues and reds. She brackets cobalt blues with unexpected planks of mint green, while holding an insistent alizarin crimson in check with shafts of cadmium red and murky grays. It’s Guston’s palette scraped and stretched apart. Thibeault takes pleasure in color, and confident of her skill, she brings us to another kind of brink with a palette that stops short of grating and unpleasant. Toying with the shrill and cold-blooded, Thibeault courageously taunts the desire for what is knowingly pleasing and tastefully comfortable. Alex Couwenberg, Danielle Tegeder and others who use similar techniques to depict far-flung (and often unseen) systems. Thibeault, like these artists, maintains an avid drawing practice, and as with her paintings, she works on several at once. They have a rigorous graphic depth as a result. Empyrean draws upon her competing impulses, modulating between line, plane and form. Openly revealing her hand-built analog construction, we see Thibeault’s touch as we trace the lines she scrapes down into overlapping forms. Resolutely non-representational, the painting is organized into disjunctive spatial relationships that open up to several possible readings. Thibeault masterfully torques the language of abstraction and projects it into a new and unsettling pictorial narrative. Marie Thibeault: “engineering, selected paintings” @ George Lawson to November 14, 2015. In her current exhibition at George Lawson, Marie Thibeault continues her exploration of environment in new large-scale abstractions. When I visited her studio near LAin 2014, her paintings were informed by unsettling news stories like the revelation that, due to the NSA's data mining activities, we were living in a surveillance state. In these new paintings, her focus has shifted to the uncertainty created by violent environmental upheaval and the individual's vulnerability in the face of powerful forces. The jangled, saturated color, buckling architectural forms, shifting landscape spaces, and jittery brushwork give visual form to the artist's anxiety and sense of helplessness. No Entropic school of art has announced itself as such, but the concept seems to animate a good deal of drawn and painted work of the past decade or more -- images of intense and unpredictable energy, change and disorder. Julie Mehretu might be considered a chief practitioner. The speed and unwieldiness of the information age is one clear source for the vocabulary of charged, global fluidity; a post-9/11 tenor of physical and political uncertainty is likely another. The increasingly volatile collision of nature and culture, in the form of large-scale natural disasters, is yet another catalyst for this type of work. Marie Thibeault, a painter based in L.A., set her last series in the landscape forged by Katrina. Her new paintings, in the lamentably final show at George Lawson, are loosely focused on "Funtown," a New Jersey amusement park ravaged last fall by Hurricane Sandy. The paintings are images of motion machines and dynamic motion machines in themselves. Roller coasters and ferris wheels appear, usually fragmented, as central icons within agitated fields of vibrant color. These structures compromised by the storm also serve well as metaphors for the spasmodic rhythm of experience (the coaster) and the cyclical nature of time (the wheel). Thibeault's palette swerves from the pungent to the sweet, from riotous to sober. Each of the five large and eight smaller canvases enacts a dazzling disturbance, the rich commotion of the brushstrokes allowing neither eye nor mind a safe, static place to rest. of breakdown, breakdowns of representation or both. purely abstract reading of Thibeault's pictures all but impossible no matter what she intends. see here before many of them occurred. Humanity never runs short of crises. they show her wresting her attention free of dire events' dispiriting power. Thibeault also seeks a sort of consolation in painting's freedom to release color from reference. stretches from our inner lives to our handheld devices - can still be broken. mounted on crisp aluminum sheets. by David Roth, ,June 4, Northern California. Los Angeles Times, “ Its Alive with Wit and Diversity” by Christopher Knight, Jan. 25, pg. LA Weekly, “Art Pick”, Peter Frank, February 28,Los Angeles, CA. New American Paintings, Issue# 67, juried by Tumelio Mosaka.